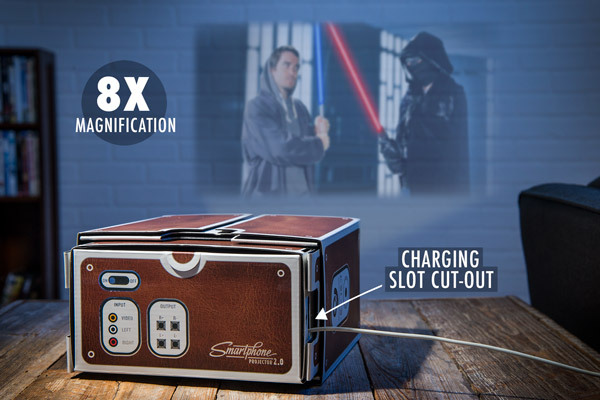 Smartphone Projector: Transform your mobile device into a big screen. The Smartphone Projector is a charmingly lo-fi way to share your phone's screen. Just place any smartphone that will fit into the cardboard box and the lens enlarges the image by up to eight times! 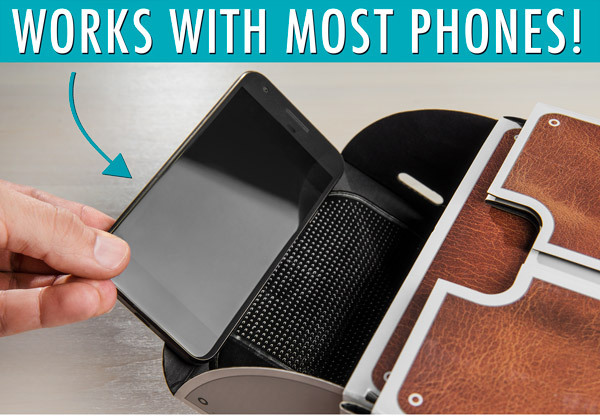 Since the whole thing is made from cardboard and glass, it’s ultra-portable, totally wireless, and uses no additional power. 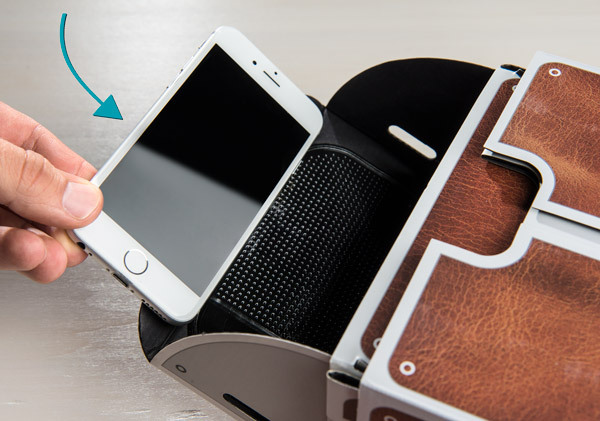 The Smartphone Projector is a pre-made cardboard kit featuring a soft matte laminate finish, silver foil accents, and faux leather styling. All you need is a dark room and the phone in your pocket. After setting it an appropriate distance from the wall, expand or contract the projector housing to set the focus, sit back, and enjoy! With the Smartphone Projector, showing the latest viral video to your friends becomes a shared experience instead of a toe-stepping, neck-craning frenzy. Display your vacation snapshots on your living room wall, throw up some visuals for a house party, or watch a film in bed. And kids will enjoy the feeling of having their very own personal movie theater! Works with any smartphone or iPod smaller than 3.2" x 6.2"
The Smartphone Projector has been updated since this video was made. It now comes pre-assembled, can fit slightly larger phones, and the black trimmings have been replaced with brown. 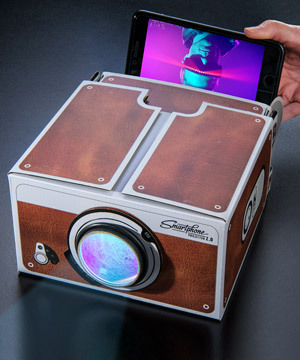 Throw some popcorn in the popper, decide if it's going to be a rom-com or an action flick, hit the lights and enjoy a night in with this cardboard projector. Just crank up the brightness on your smartphone and focus the image to set up your own little movie palace. 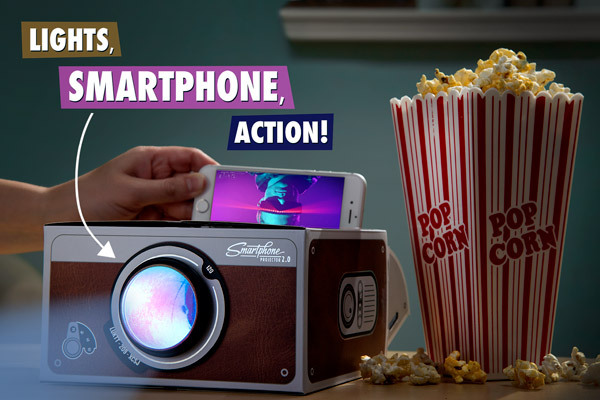 Slide your phone into the projector and then make the popcorn. Go ahead and share all of your Instagram photos with friends or watch all three extended Lord of The Rings movies in one sitting. With the built-in slot for your power adapter, you can view all of your phone's content from the comfort of your couch, bed, floor, or wherever! Binge watch in style with the Smartphone Projector. The Smartphone Projector can accomodate nearly any phone. Any device up to 6.2" wide and 3.2" tall will fit. From the box to the big screen in minutes. Question: Will it work with my phone? Answer: If it fits inside the box, it'll work! If your device is smaller than 3.2" x 6.2", then you're ready to go! Both the iPhone 6 Plus and 7 Plus will fit inside (well, not at the same time). Question: How big is the image? Answer: The Smartphone Projector is definitely not meant to replace a big screen or a high-end projector. However, it can magnify your smartphone's screen by up to 8 times! So, a 6" wide screen will project to 48" across. That's perfect for impromptu movie nights. Question: Is it bright enough to see? Answer: Absolutely! That being said, you must project the image on to a white wall or a white sheet, and the room needs to be as dark as possible.